An irresistible combination of garlic kimchi flavor and a crunchy texture! This kimchi features well-dried pickled radishes flavored with a little added garlic. 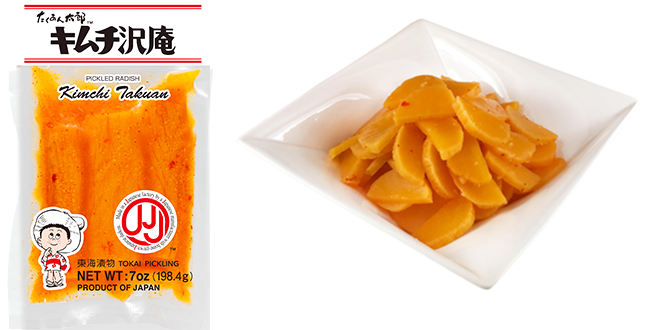 A crisp texture combines with the delicious flavor of dried, pickled radishes and the stimulation of spicy chili pepper. It's perfect with your daily meals or a drink! DRIED RADISH, WATER, HIGH FRUCTOSE CORN SYRUP, SALT, SORBITOL, MONOSODIUM GLUTAMATE, GARLIC, ONION, SUGAR, RED PEPPER, FISH SAUCE(SARDINE, SALT), ACETIC ACID, PAPRIKA, ASCORBIC ACID(PRESERVATIVE), POTASSIUM SORBATE(PRESERVATIVE), FERMENTED SEASONING(RICE, GLUCOSE, SALT), CITRIC ACID, GUAR GUM, SODIUM ACETATE, YEAST EXTRACT, LACTIC ACID, XANTHAN GUM, FD&C YELLOW NO.6(SUNSET YELLOW FCF), FD&C YELLOW NO.5(TARTRAZINE), RICE BRAN.